The past two weeks have been a bit busy with the two back-to-back Martingale-Moda retreats – ReStore for shop owners and Quiltstock for folks-like-us. A few of the ReStore ladies were treated to a tour of Moda and the most-photographed item in my office was this bag – the one with the yellow button. The problem started before I even got home. I was obsessed with making one. Or at least two – most of my jeans come with two legs so using one leg for a bag meant I’d still have another to use. So here goes. Start with the leg of a worn pair of jeans – the softer the better. Decorative stitching on the seam like that on the two bags above is optional. Embellishments – as desired. Mini Charm packs work beautifully for this! Length required – that depends. I found that 10″ to 11″ worked really well regardless of the width of the jeans’ leg. If the jeans are really “big boy” jeans – a width of 18″ to 20″ – then an 1″ or so more will work. It depends on what you want to do with the finished bag. Turn the leg wrong-side out – inside out. I recommend pressing it flat as it will make this step a little easier. One seam should be on the side, the other will not be – as shown above. Using the same seam allowance as is on the jeans leg – 3/8″ on this particular leg – or a 1/2″ seam allowance, sew the side of the leg so that is is straight. Sew a 1/2″ seam allowance all the way across the bottom. Using a ruler and some kind of marking tool – I used a Sharpie pen – mark the corners. The lines should be the same distance from the seam line as from the fold. Depending on the width of the jeans’ leg, I recommend 1″ to 1 1/4″. Note: I goofed on this bag and measured from the bottom edge instead of the seam line. It still worked but it did make matching up the seams after the corners are trimmed a little less neat. Just saying. Match up the edges – folding the denim at the corner cut – and stitch a 1/4″ seam allowance across the opening. This will “box” the corners. Yes, the sewing will be a little easier if you keep the bottom seam open. Embellish as desired. I found it a little bit easier to do this at this point since I would have a better idea – better, not perfect – of how the bag would sit after this step. How wide is the strip? This is the same measurement as the length of the jeans leg. E.g., If the leg is cut to measure 11 1/2″ from top-to-bottom, the width of the strip will be 11 1/2″. How long is the strip? Cut the length to measure the width of the jeans plus 1″ – 1/2″ seam allowance on both sides. E.g., If the jeans leg measured 14″, cut the fabric to measure 15″ long. So from the fat quarter, I cut a strip that measured 11 1/2″ x 15″ wide for a jeans’ leg that measured 14″ wide (7″ flat, double-thickness) x 11 1/2″ long. From the Soft & Stable, cut a piece that is 1/2″ less in width and 1″ less in length – or 11″ x 14″. This is not required but I found it easier not to have the bulk in a couple of the seams. Quilt as desired. Or not. I liked the way it looked quilted, and with Soft & Stable, I could quilt it without a lining. The adorable bags by Allison of Basic Grey were not quilted. Using a 1/2″ seam allowance, join the sides to make a tube that measures the same as the jeans’ leg. Center the seam and press it open. Note: This picture has the bag upside down – the end with the 1/2″ exposed fabric is the top edge. The end with the batting all the way to the edge is the bottom of the bag. Stitch across the bottom – except don’t stitch all the way! Leave an opening approximately 2″ to 3″ – or stitch a little more than your measurement from the side. E.g., if you’re going to mark 1″ away from the side, stitch at least 1 1/2″. Sharpie – love them. Note: Yeah yeah… as before, I wasn’t paying attention and measured the distance from the bottom edge, not from the seam line. Do what I say, not what I do! Match up the edges – fold at the corner. Use a 1/4″ seam allowance and stitch across – yes, keep the bottom seam pressed open. With right sides together, put the jeans’ leg inside the lining. The seam for the lining will be in the back – and it will not line up with a seam on the jeans’ leg. The boxed-corners will help with the placement of everything. 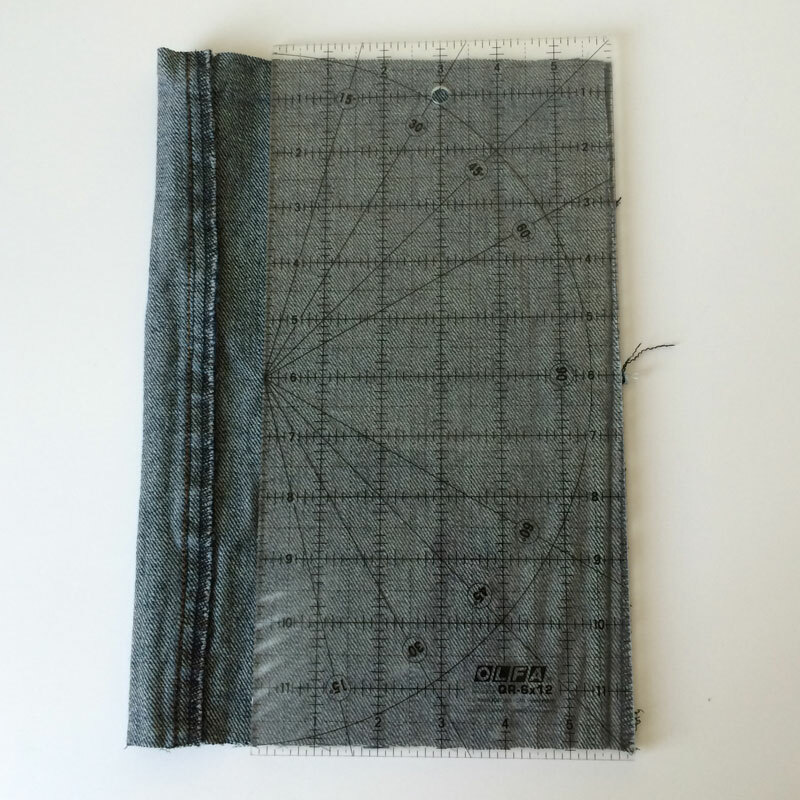 Using a 1/2″ seam allowance, sew all the way around the bag. Reach into the opening in the bottom of the lining and carefully pull the jeans bag through the opening. Continue pulling the bag through until it is the seam joining the pieces is fully open – press as desired. Stitch the opening at the bottom of the lining closed – by hand or by machine. Guess which one I picked? At this point, I feel it is necessary to tell you, in the interest of full disclosure to be completely honest with you. We’re friends, right? Making these bags is just a teeny, tiny bit… addictive. They’re relatively fast. They’re cute. Okay, they’re adorable. And if you’re at all into embroidery, the possibilities for embellishment are endless. Don’t say I didn’t warn you – or at least try. Could ne gave a printable pattern? We are spoiled by Moda!!! Love this! I made one but made a circular bottom, it was bigger but more of a pain to figure out. I like your boxed corners more. Easier and the quilted lining is extra cute. My mind is already thinking of multiples of these, so I believe they are going to be addictive! OMG this little bag is soooo cute. Thank for reposting this! I had a great time taking your class and meeting you at Quiltstock! What a nice finish, such a good idea for gifts. Lovely colours. Carrie, after reading your blog for years it was a thrill to meet you and then to spend 5 days WOW! And what did I work on yesterday….Opening Day. BTW pictures and instructions for bag are so detailed I may have to make 1or many. The bags are adorable! What about using a laminated or vinyl coated print for the lining if you are using it for a thread catcher so that the threads shake out easier? That’s a genius idea! Thank you Pat! I just put a yard of denim in the washer to shrink. I am going to make my own “pants legs” to make these baskets. Thanks for repeating the instructions. They are fun to make and very popular. Oh, I want so much to make some, I can nearly taste it. But other things first. OMG!! That’s all I can say!! Thanks! How would you attach a handle to make a pocketbook? So cute! So glad you re-posted these instructions! I remember the first time that I saw these baskets and thought “how adorable”. Of course I didn’t have any old jeans on hand, but I do now…. I would love it if all of the articles from Moda’s Cutting Table had that cute little “printer friendly” version located at the bottom of each article. Then I could print out all of these terrific articles. Probably a silly question, but did you machine sew the decorative pieces on the denim and if so how did you do that if it’s in a tube shape? I know you fused them but then you stitched around the edges. For years I have been wanting to try this!! Just love re using jeans <3 Thank you so much for the tutorial. It was enough to motivate me to start some!!! Please make your instructions printer-friendly or in a PDF. I can’t possibly remember all of it! Ask and you shall receive… http://blog.modafabrics.com/2018/08/a-little-of-this/ Happy Friday! Oh my gosh! These are so cute!!! I can’t wait to make a couple.